I observed when we moved into our house in 2011 that it was south-facing and solar panels might be possible (Catch and store energy, Use and value renewable resources). However we also had other urgent work to do on the house and couldn’t find good information about the carbon cost of the panels themselves, so decided to leave it (Apply self-regulation and accept feedback). Three years later and with a change in financial circumstances I thought it was worth revisiting (Creatively use and respond to change). Design brief: establish whether solar panels were a good fit for the house and act accordingly. Establish financial cost and ‘buyback time’ of solar panels (Obtain a yield). Establish carbon cost / total lifecycle cost and ‘buyback time’ of solar panels (Produce no waste). Establish whether inverter would have to be in the loft (an absolute no for us as the loft is a bedroom) (Observe and interact). Establish whether our roof is a viable site. Look into any other renewable energy options (Design from patterns to details). Draft excluder on bottom of garage door. Consider curtain in front of door from garage into house (as existing draft-proofing isn’t entirely working though it is much improved). Further lagging around hot water cylinder as we get hold of more old blankets / extraneous bubble wrap (Produce no waste). Wood-burner for heating/hot water: Our gas boiler was replaced in 2011, the house has no chimney, we have little room for storing wood, and we live in the middle of London. Ripping out the existing (efficient) system for a wood burner seemed like a bad idea (Use small and slow solutions). We’d have to either scavenge wood (which no one in the house has much time to do (People care), or order it delivered in bulk (and we have nowhere to store it (Apply self-regulation and accept feedback). Solar hot water: would mean replacing existing (fairly new) cylinder; and most of our hot water use is in the morning. Water heating is gas so financially not worthwhile. Wind: we live in central London, and wind turbines don’t work that well in cities (Observe and interact). Solar panels: South-facing unshaded roof with plenty of space. Definite possibility! Solar looked easily our best bet. Their life cycle assessment suggested that pre-2004 ‘energy payback’ was about 7 years, and that more recent studies suggested 2.5 years. The carbon payback was a similar length of time. Their solar calculator suggested that for an average installation on our site, financial payback would be about 9 years, and energy payback around 2.1 years. Their cost estimate was around £6,000 (with £560/year earnt from electricity used for free or sold to the grid + feedin tariff). As we live in London this was likely to be a bit higher. Solar panel lifespan should be 25-40 years (or possibly more). So we could reasonably expect our panels to outlast their ‘buyback’ period by an order of magnitude for energy/carbon cost, and 3-4 times for financial cost (Obtain a yield). I also found information suggesting that not only could one install the inverter in a garage but it would be better to do so (Use edges and value the marginal). Our south-facing, unshaded roof looked like an ideal site for solar panels (Capture and store energy). This information was strongly enough in favour of solar panels that I sought quotes from various companies working in the area. The only ones who got back to me with a quote were Joju Solar, whose quote broadly substantiated my existing research. I also discovered that while solar panels are “permitted development”, our covenant meant that we had to get written permission from Southwark Council for the work. It was clear that solar panels were the best renewable option for our situation. Financial buyback: £862 earnings year 1; buy back in 8.24 years; £31,410 earnings (reduced bills + FIT + export payments) over 25 years. Carbon buyback: not specified, but should be similar to the CAT figures i.e. about 2-2.5 years. Annual CO2 savings were 1.93 Tonnes. They were happy to install the inverter in the garage, and confirmed that our site was suitable. We decided to go ahead. I applied for written permission from Southwark Council, which we would need before work started but could assume would be granted as it is permitted development. Sunpower E20 solar panels (expensive but good quality). Power One Aurora PV1.3.6 inverter (good reputation). 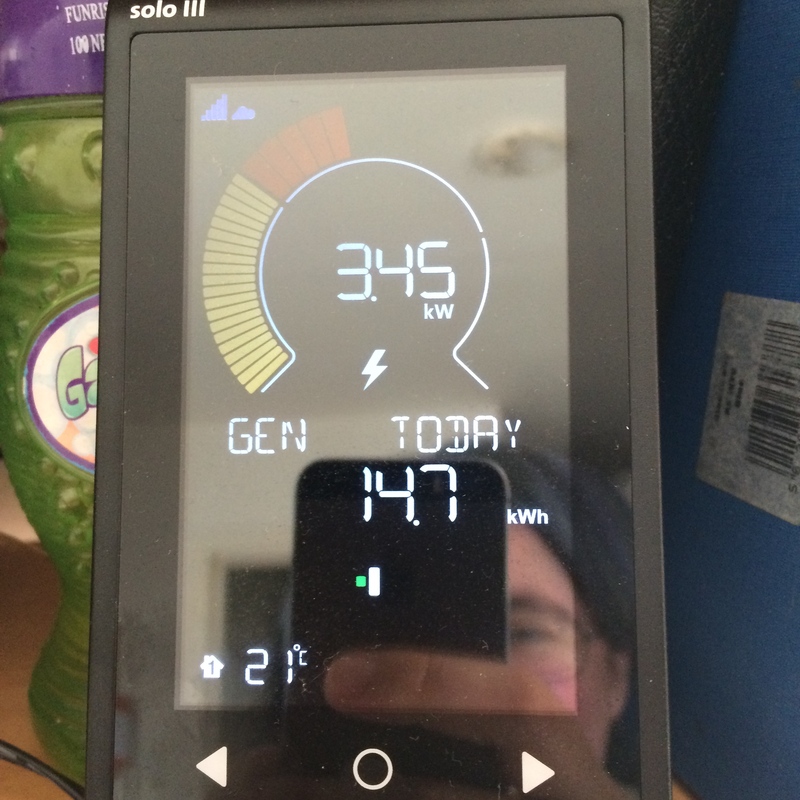 Solo III wireless monitoring: has both a meter display in the house, and online access including historical data, so we can make better use of the electricity generated and be aware of any problems (Apply self-regulation and accept feedback). Inverter to be installed in garage, just on the other side of the wall from the fuse box (Integrate rather than segregate). This minimised internal wiring and the need to drill through walls. The roofers could replace our gutters on the south side of the roof while they had the scaffolding up (Integrate rather than segregate). The job should take 3 days from scaffolding up to scaffolding down. We had someone booked to replace our patio (a separate job), so Perry and I agreed we would negotiate around that, and try to get the panels in first to avoid any risk of damage to the new stone (Produce no waste). The provisional date was mid-Feb, though we had to wait for Southwark Council’s permission. Unfortunately that took far longer than expected and the patio went in in the meantime. Once planning permission was granted, JoJu Solar offered to put the panels in immediately, as they had a gap in their schedule, and we were able to go with that. This also meant we were able to register for FIT before the tariff drop on 1 April 2015. (Creatively use and respond to change). The setup was commissioned 30 March and fully running 31 March 2015. One major advantage of solar panels is that they need very little direct maintenance. The inverter will need to be replaced in about 10 years so we will budget for that. The other ‘maintenance’ issue is making the best use of the energy. We opted to buy an energy usage meter that saves and uploads our data to assess this more over time, and I intend to look at the information after 6 months and again after 12 months. iPhone/Android charger — 2kWh / year. iPad charger — 10kWh / year. Laptop charger — 72kWh / year. *** Source: Rangemaster product info. Conclusion: while we should still try to charge gadgets in the daytime where possible, their usage is very slight. The dishwasher and washing machine use far more, but the capacity of the panels would more than cover using both at the same time when panels are generating at full capacity. The kettle is the highest use, closely followed by the oven. From these figures, it’s worth using the electric rather than the gas oven (we have both) on sunny days but may not be on overcast days. It will be useful to track generation levels at different times of day and different times of year, and use that to create guidelines of when the panels are likely to be covering specific uses. From the first few days after the panels went in, we could conclude that even on overcast days, during daylight hours the panels produce enough to cover the electricity usage of running the house without any major appliances switched on. (So: running fridge/freezer, router, server, boiler controls, & other 24/7 kit.) We also immediately began tweaking our usage patterns to run the dishwasher in the daytime instead of overnight. I intend to assess the usage (our usage data is available to download online) six months in, and again twelve months in. We did run into one problem: after the panels had been put in, the lights in the loft conversion no longer worked. This turned out to be because the cables had been put in between the rafters and the roofing felt, rather than (as building regulations dictate) through the middle of the rafters). NOTE: this was done in 2008 by the builders converting the loft, several years before we bought the house, and was not in any way the fault of the solar panel fitters. At some point a screw had been put through one of these cables (invisible from the roof as under the roofing felt), causing a dead short. The good news was that no one had been electrocuted in the process. The bad news was that we now have to fix this properly. At time of writing we haven’t yet got around to doing it. 345kWh generated, of which we used 74.9 kWh and exported 269.9 kWh. This bodes fairly well for the longer-term accuracy of the figures we were originally quoted. We have changed a few habits already: waiting to run the dishwasher and washing machine until the solar panels will cover the use (at this time of year this is from 8am or earlier); charging devices in the daytime. I have also noticed myself being more likely to unplug items on standby, and one of my partners has stopped overfilling the kettle (Earth care). We also all agree that we find looking at the monitor (which lives on the kitchen shelf) to be very cheering! So installing the panels has improved everyone’s daily mood (People care). Panel monitor as of 13 April 2015, at 13:25 BST (so just after solar noon). I was boiling the kettle at the time, and still exporting (the little green dot at the bottom shows export)! Positive: Having a clear goal made it easier for me to assess what I needed to confirm before finalising the design (e.g. : making sure that this really was the best bet for our site by researching other options; looking for other energy efficiency improvements to make). The design process also made sure that I did consider these issues. Negative: I should have started the Southwark Council planning process sooner as that was in the event the major block to the process. Interesting: Writing this up as a design meant that I already had a list of appliance power draw when the rest of the household was wondering about this after installation! Earth care: We’ve reduced our carbon footprint. People care: It was a fairly low-impact process; the actual installation took 2 days, with a half day each side for scaffolding up/down. We also employed people in the solar power industry! Fair shares: We’re fortunate to be in a financial position to put money into microgeneration/solar. It makes sense for us to take advantage of that when others might not be able to, to increase the microgeneration/renewable capacity of the UK/the world. It’s not a universal-fix solution, but it’s a small-scale one.